We’ve been calling it by its project name BP23. We’ve been thinking about it as the three-seat successor to the McLaren F1. 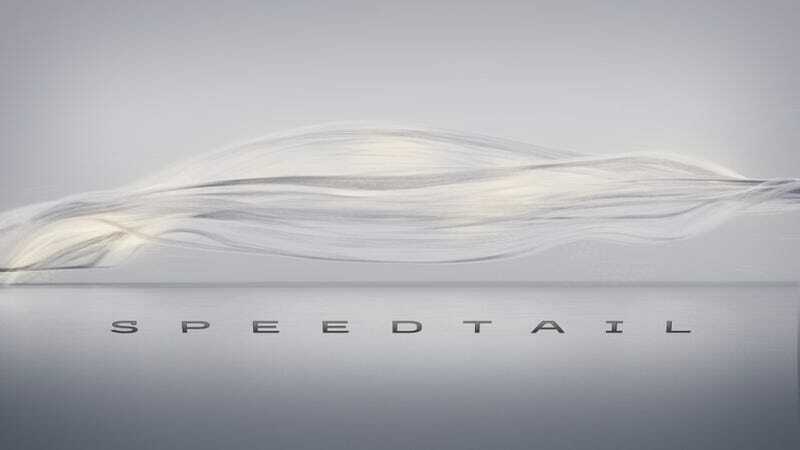 But now know it by its official name: McLaren Speedtail, and this is possibly because McLaren has run out of other names to give it. Apparently the company is gunning for a higher top speed than the F1's 243 mph, which is kind of funny, since the original F1 famously never attempted to set a high top speed it just kind of fell into it by way of filling out its actual design brief, to be as unfiltered and perfect a driver’s car as conceivably possible. Oh wait, we knew that already. Nevermind. McLaren is calling it a “Hyper-GT” and says it will be the most luxurious McLaren ever. I am very much intrigued. We’ll see it at Geneva, after the 106 people who have reserved it, then leak photos of it online from their Blackberries.